Aurigo BRIX 5.1 is a construction management software product suite that automates Land Management, Project Estimation, Contract Management, Facility Management, and GIS Mapping. BRIX connectors to Microsoft Dynamics AX and Microsoft Project extend the suite to a fully fledged construction ERP solution that includes: Project Planning, Financial Budgeting, General Ledger, HR, CRM and Inventory Management. Aurigo BRIX is a revolutionary, web based product with advanced features that automates multiple phases of construction projects. It allows owners, contractors and inspectors to accurately estimate manage and inspect capital improvement and construction projects. 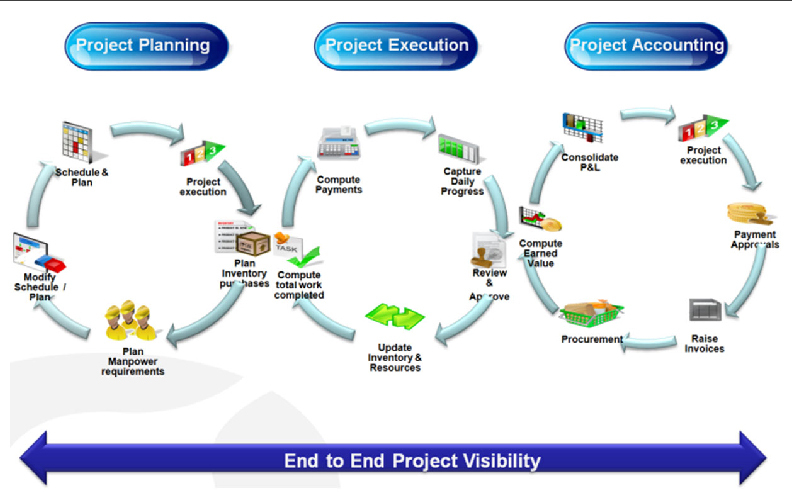 The solution helps construction companies to increase profits and enhance their current business integration systems. With Aurigo® BRIX 5.1 you get a comprehensive set of construction management tools that helps each member of the construction team manage and automate the critical processes of estimation. With Aurigo BRIX 5.1 you know the exact status of your projects - no matter how complex or dispersed. Relevant project information is proactively pushed to you, transforming your company into the information enterprise. Manage unexpected contract changes and change orders with ease. Simplify management of submittals, transmittals and general project documentation. With all information in a single repository, complex reports and information queries allow you to stay on top. 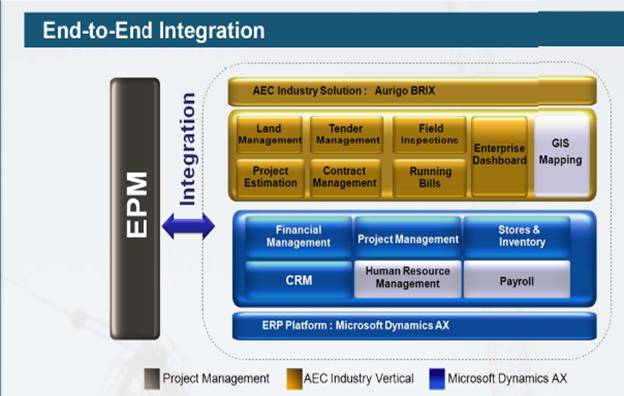 Aurigo has extended its industry leading product by integrating it with the powerful Microsoft's Dynamics AX, ERP suite. Customers to reap the benefits of a fully automated Contract Management and Project Estimation system integrated into the industry leading ERP system, providing a full lifecycle solution for the construction vertical. Aurigo BRIX 5.1 also seamlessly integrates its database with other third party software applications using web services and XML technologies. Aurigo BRIX 5.1 supports dynamically loadable modules that allow for the easy addition of new capabilities. The Aurigo BRIX 5.1 system comprises standard core modules and system extensions, such as customizable reporting, Contract management, Estimates that can be purchased by the customer and dynamically added to the core Aurigo BRIX 5.1 platform. Aurigo BRIX 5.1's customization capabilities allow our customer to configure the system to meet their needs and only pay for required capabilities. In addition Aurigo can easily extend the core capabilities of the platform to meet customer specific workflow needs. Archive Historical Project Cost Information. Offers Instant Project Visibility Anytime and Anywhere. Allows Users to Track and Manage Critical Assets. Better and Faster Decisions Through Real-Time Business Intelligence. Manage Project Costs and Profitability. Extends Up-To-Date Project Information Out Into the Field. Expedite the Data Entry Process. Significantly Increase Consistency and Accuracy. Supports PDAs, Tablets and Laptops. Take Notes, Photos, and Identify the Exact Location of Construction Items. Integrate Newly Captured Data with Existing GIS Data Investment. View Construction Progress on an Overlay of Maps and Drawings.